If you're wondering why Austin Gomber hasn't lost a decision since April 29, look no further than the fifth inning on Saturday night. After allowing singles to Greg McCall and Luis Aviles and walking Tucker Neuhaus, the southpaw had the bases loaded with nobody out and his team holding a 4-0 lead. "I kind of looked at the catcher [Brian O'Keefe] and was like, 'All right, let's get out of it,'" Gomber said. The Cardinals' No. 22 prospect struck out Mitch Meyer and Sthervin Matos and got Blake Allemand to ground out to quell the threat. He retired to the dugout after giving up two hits and two walks while striking out 10 over six scoreless innings as Class A Peoria held off Wisconsin, 4-2, at Dozer Park. "I actually had that situation one time earlier this year where I got out of it, so I know it's possible even though it's kind of daunting at first," Gomber said of the fifth-inning jam. "Really big moment in the game, especially for me, personally, and for the team. It kept the momentum on our side. We were up, 4-0, at the time; another hit or two and it could have been a 4-3 game just like that, so to get out of that was pretty big." The win was the 13th straight for the 2014 fourth-round pick, giving him a share of the Minor League lead at 14-3. Whether the record is due to a little luck or an ability to battle in tight games, Gomber couldn't say. "I think it goes both ways," the Florida Atlantic University product said. "Sometimes you get a little lucky, but throughout the whole streak the offense has been incredible. It feels like every game I pitch we put up runs in the first inning and then my job is to keep them off the board. "Still, there were some close games that we've won and there have been some games where I've given up some runs and we just outscore them. " Gomber has pitched well, especially down the stretch. His 2.79 ERA -- bloated by difficult months in April and June -- underscores how dominant he's been in the second half. The 21-year-old left-hander is 8-0 with a 1.84 ERA while limiting Midwest League opponents to a .181 average since the All-Star break. Much of the success has come since adding the strikeout to his arsenal. After fanning 36 batters in 11 starts with Class A Short Season State College last summer, Gomber has surged to the Midwest League lead with 132 punchouts. "I worked really hard this offseason and added a curveball to my repertoire, and it's kind of taken over and become my best pitch," Gomber said. "I've been able to put a lot of guys away with that. Once I start pitching against these teams multiple times, they start looking for it, so I'm able to strike some guys out with the fastball. I'm just making some good pitches. Basically, all three of them, just executing them at the right time." 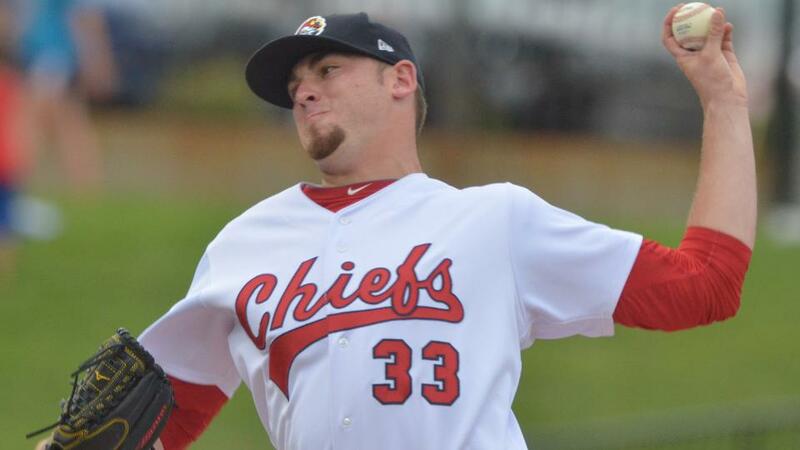 Coincidence or not, Gomber's turnaround has mirrored the Chiefs' surge in the second half. Since finishing in fifth place in the Western Division with a 33-35 first-half record, they've moved up to second place in the second-half standings at 35-19. "I have a lot of confidence right now in my game, and we're playing really well in the second half of the season," Gomber said. "It's just a different attitude than it was in the first half. The clubhouse is a lot lighter, everybody's more confident and I think everybody's just feeding off each other. "When I go out there, I just try to go out and give our team a chance to win, and it's been working out." Nick Lomascolo kept the shutout intact through the seventh, but Dixon Llorens gave up two runs on two hits and two walks in 1 1/3 innings. Kyle Grana recorded the final two outs for his 20th save. Timber Rattlers starter Jon Perrin (1-5) surrendered four runs and eight hits with seven strikeouts over five frames.